My Friday was hectic as I am counting down toward Easter Sunday. After a morning of shopping, which I hate to do, I wanted to cook which I love. I wanted comfort food and bread is my ultimate comforting taste. I was craving something slightly sweet. I used a recipe I found at Just a Pinch for some sweet yeast rolls. They look beautiful but are not as sweet or light as I had hoped. Still a very good roll. Next time I may not bake them the entire 20 minutes. The 25 would have been way too much. additional butter for coating bowls used and brushing on tops of baked rolls. 1 Scald milk (bring just to a boil and remove from heat immediately. Stir in sugar, salt, and butter. Set aside and allow to cool to lukewarm. In a large bowl mix warm water and yeast. Stir until dissolved. Stir in lukewarm milk mixture, beaten eggs, and half the flour. Beat until smooth. Add remaining flour gradually, mixing as you go. You may need a bit more or less than the total 4 1/2 cups called for in the recipe, depending on the humidity and other factors. Your dough should be elastic and slightly stiff but not dry. 2 Turn dough out onto a floured board and knead until smooth and very elastic. This usually takes 8-10 minutes. 3 At this point you can shape and fill as desired. 4 Preheat oven to 375 degrees when rolls are about 10 minutes from being ready for baking. When ready to bake place rolls in oven and bake for 20-25 minutes. They should be browned nicely and smell so good and yeasty! 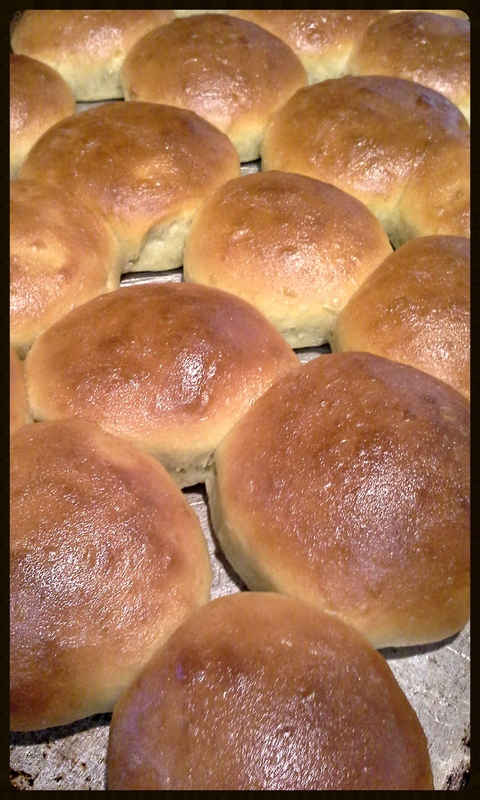 Brush tops of rolls with melted butter immediately when out. 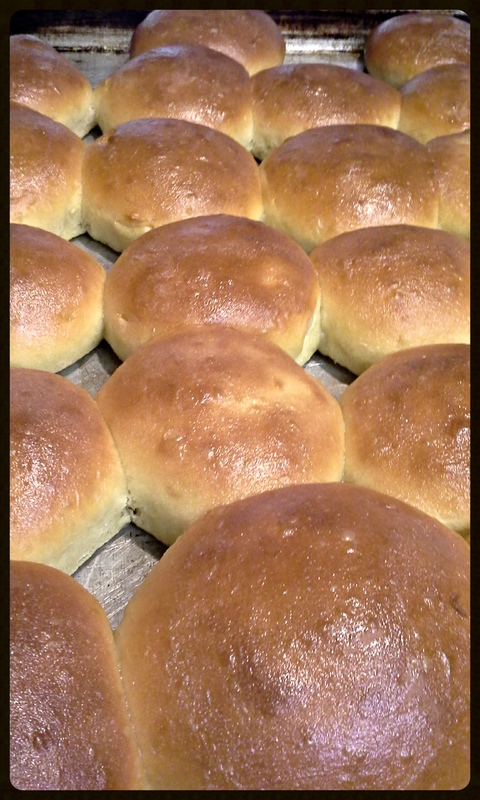 Talk about some great homemade buns! Place all ingredients in pan of bread machine according to manufacturer’s directions. When cycle is complete, turn out onto floured surface. Cut dough in half and roll each half out to a 1″ thick circle. Cut each half into six 3 1/2″ rounds with inverted glass as a cutter. Place on greased baking sheet far apart and brush with melted butter. Cover and let rise until doubled, about one hour. This Banana Pecan Wheat Bread made good french toast because the bread is not cake like, which makes it easy to slice in a uniform manner. This is a bread machine recipe from Fleischmann’s Yeast, although the link to this particular recipe seems to be gone . While I was not crazy about the loaf in itself (not sweet enough for a banana bread in my own opinion), it did make some very good french toast. Measure all ingredients, except pecans, into bread machine pan in the order suggested by manufacturer, adding bananas with water. Process on basic/white bread or fruit and nut cycle, adding pecans according to manufacturer’s directions; use light or medium/normal crust color setting, as desired. Do not use delayed-bake feature. Remove bread from pan; cool on wire rack. NOTES : Do not make loaves larger than recommended by bread machine manufacturer. Use the 1-pound recipe if your bread machine pan holds 10 cups or less of water. Use the 2-pound recipe if the pan holds 13 cups or more. Lemon Tea Bread and Lemon Balm Butter was a great way to implement some of my lemon balm and lemon thyme. This recipe is from Cooks.com. Link to recipe. I did lighten things a bit by using light butter and 1/2 sugar-1/2 Splenda in mine. It came out really good. Instead of glazing it with the glaze recomended I heated brown sugar and lemon juice to put on the serving plate and mixed together some light butter with lemon thyme and lemon balm mixed in. 6 tablespoons butter — room temp. Heat milk with chopped herbs, steep until cool. Mix flour, baking powder and salt in bowl. Cream butter and sugar in another bowl, add eggs, one at a time, add lemon peel. Add flour mixture and herbed milk alternately; blend. Pour in loaf pan and bake at 325 degrees for 50 minutes. Glaze bread while hot with paste of: juice of 1 lemon and confectioners’ sugar. The World Bread Day post is up!